The net sits empty after the Minnesota Wild pulled goalie Devan Dubnyk during the 2015 playoffs. During the 2014 NHL playoffs, Patrick Roy did something unusual for a guy who holds the postseason record for wins by a goalkeeper: As the coach of the Colorado Avalanche, he started pulling his net minder much earlier than traditional strategy suggested he should. In Game 1 against the Minnesota Wild, Roy yanked Semyon Varlamov with 3:01 remaining. With 13.4 seconds to go, the Avs’ Paul Stastny tied the game, and he then scored the game-winner seven and a half minutes into the first overtime. In Game 4, Roy pulled Varlamov with 2:34 to go. The Avs lost, but Game 5 saw another early pull — at the 2:22 mark, seconds after killing off a two-minute penalty — and a second OT win. In Game 6, Roy called off Varlamov with 2:45 left, and the team promptly gave up a couple of empty netters. On average, the coach pulled Varlamov 50 seconds earlier than he had during the regular season, and about 90 seconds earlier than coaches in the rest of the league. Although Roy and the Avalanche lost the series in seven games, he was a trailblazer. Since then, to the glee of NHL analytics types, pulling a goalie with several minutes to go when behind by a goal has become standard practice for some teams. It took decades of work, but the statheads have finally bent the league to their will. Teams are now willing to lose if it will help them win. 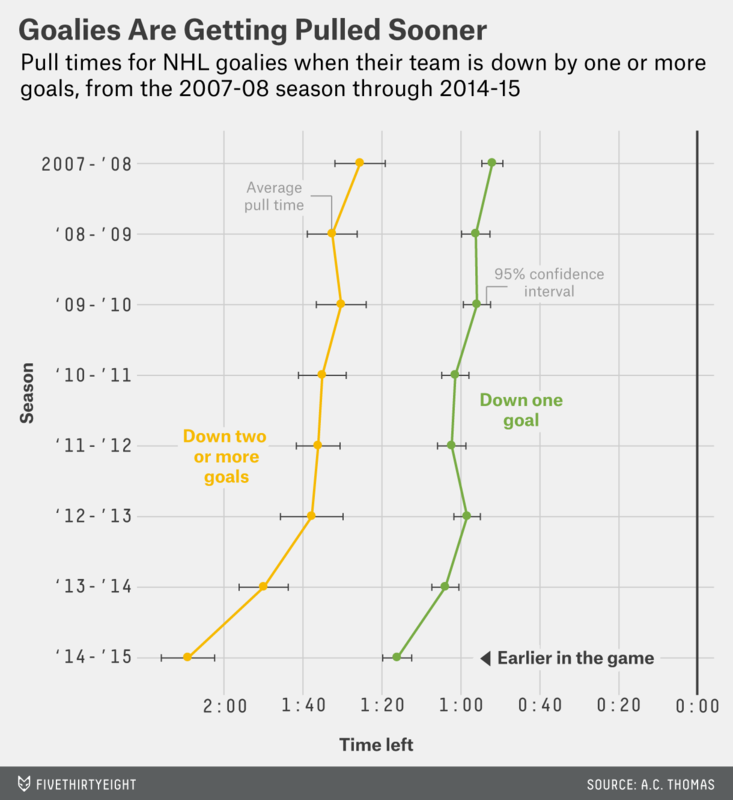 But the early goalie-pulling trend wasn’t simply a phenomenon of the 2013-14 playoffs. It accelerated during the 2014-15 season. The Nashville Predators pulled their goalie with an average of 1:50 remaining when they were down a goal, 48 seconds earlier than they had done the previous season. League-wide, 18 teams had an average pull time of more than 70 seconds remaining when trailing by a goal. Between 2007 and 2011, just a single team pulled its goalie with more than 70 seconds remaining in the game, on average. The chart below shows average pull times1 over the last eight seasons, along with 95 percent confidence limits. When trailing at the end of games, teams were more aggressive during the 2014-15 season than ever before, willing to risk a more lopsided defeat for a better chance at winning. When teams are down two goals or more, the change is dramatic. During the 2014-15 season, the Florida Panthers pulled their goalie an average of 59 seconds earlier than they had during the previous season. The Carolina Hurricanes, New York Islanders, Toronto Maple Leafs, Winnipeg Jets and Vancouver Canucks all did so at least 45 seconds sooner. Across the NHL, teams down two scores pulled their goalies with about 2:10 remaining, almost half a minute earlier than they had the previous season. Hockey analytics lovers want coaches to pull goalies earlier for one simple reason: Mathematically, it’s a no-brainer. In fact, academics have argued for a more aggressive strategy as far back as 1976, when Detroit Red Wings fan and Stanford Ph.D. Donald Morrison created a model showing that teams had the best chance to win if they pulled their goalie with about two and a half minutes remaining when down one goal. “If you pull the goalie with two and a half minutes to go, you have a 19 to 20 percent chance of tying the game,” Morrison said when we called him last month. If a coach waits until the minute mark, the chances drop to 17 percent. In the past few years, hockey analytics practitioners have harped on the issue. University of Florida associate professor Andrew Thomas, co-founder of the hockey analytics site War-on-ice.com, built a pulled-goalie app that tells teams when to yank somebody out of net. And a pair of Canadian professors put together a series of papers claiming that a more aggressive strategy would pick up an additional point and a half over 82 games, on average, compared with the current practice. In 2014-15, both the Boston Bruins and the Los Angeles Kings missed the playoffs by just 2 points. Given that some observers called the offseason after Colorado’s 2014 series with Minnesota the “Summer of Analytics,” it’s not hard to connect the dots to what seems to have happened next. (Although no team representative would explicitly confirm the theory to us.2) The Panthers, Hurricanes and Maple Leafs — three of the teams that pulled their goalies much earlier last season than they had in the past — hired analytics researchers before the 2014-15 season. At this point, all but a select few hockey franchises have full-time analytics staffers, and Thomas himself was just scooped up by the Minnesota Wild. “They might be telling teams that 100 percent of research [about pulling the goalie] suggests that you should be [doing it] earlier,” said Brian Macdonald, director of analytics for the Panthers. While the average amount of time coaches wait to pull the goalie is dropping, many teams are still much more conservative than they should be. “It’s easy to pick round numbers like one minute,” Macdonald said about teams’ temptation to wait until an easy checkpoint. The optics of pulling the goalie — a volatile proposition that could lead to more lopsided scores — play a role in keeping coaches from doing what the numbers suggest they should. “One reason that teams have not adopted is similar to why NFL coaches may not go for it on fourth down: When it goes wrong, it looks bad,” Macdonald said. Because exact goalie pull times are not listed in NHL box scores, we used the first on-ice event with a pulled goalie as a proxy. We used the nhlscrapr package in R to obtain the data. Representatives from the Predators, Avalanche, Canucks and Rangers all declined or ignored interview requests.